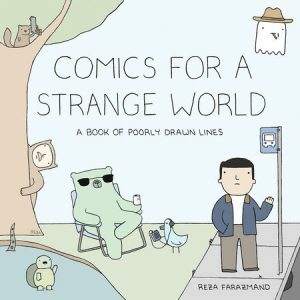 With sparseness and simplicity, Comics For A Strange World, reminds us of the beautiful absurdity in being alive. Whether the narrator is a smoking ghost, a caveman or a pigeon, Farazmand uses blunt honesty to delve into both common situations and bizarre adventures . The comics first generated a huge following on the internet and since then he has been able to turn his ideas into two books: the first, Poorly Drawn Lines was a NYT bestseller. Leaving very few topics untouched, he slyly comments on our internet obsessed culture (the pigeon goes online), our escalating culture of violence (a squirrel buys a gun) and religion (God gets called out for being an old man in a bathrobe). This entry was posted in Book Reviews. Bookmark the permalink.